In Part 1 of "Hair in History," we looked at the hair styles in ancient Egypt, Greece and Rome. Now, let's head to the Far East to see what was fashionable back in the day. In the Muslim community, hair was traditionally concealed from the public. Men wore a turban or fez and women's hair was hidden under a traditional veil. Both men and women visited the local public baths for grooming where the man's head and face were shaved and womens' long hair was given a henna rinse. Unmarried Chinese girls' hair was usually worn long and braided while older women combed their hair back from the face and wound into a knot at the nape. The Manchu regime of the time dictated that men shaved the front of the head and wore the back of the hair long and braided, tied with black silk (think an early (and more severe) mullet--business in front, party in the back). Males in Japan also favored this look and shaved the front of the head but kept the back hair pulled tightly into a short, stiff ponytail. During the Medieval period, women's hair had been long and loose but by the 17th Century the hair became more styled, swept up from the nape of the neck and adorned with pins and jeweled combs. 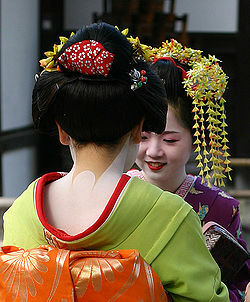 Geisha women's hairdos were especially elaborate, high and heavily lacquered and often enhanced with hair pieces. In Part 3 of our series, we'll look at Africa and the Western world. However, take this opportunity to check out all the great styles at your local Hair Cuttery.